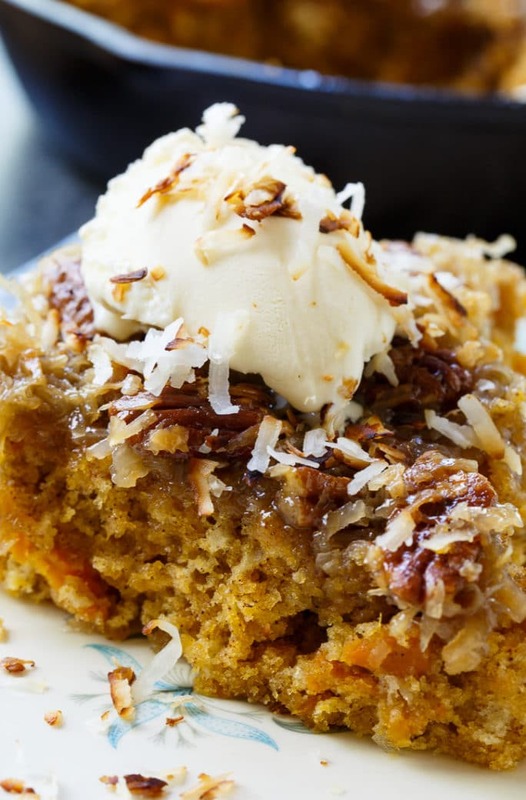 Sweet Potato Cake with Broiled Coconut and Pecan Icing is so full of fall flavor. The broiled icing is fabulously sweet and crunchy and pairs so well with the sweet potato-flavored cake. 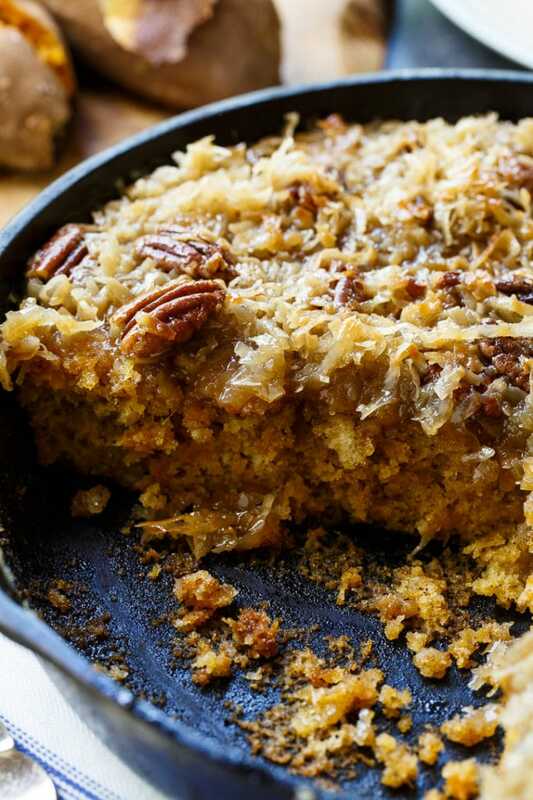 It’s the perfect fall skillet cake for sweet potato lovers and I’m definitely one of those! A few weeks ago I received a copy of Sweet Potato Love: 60 Recipes For Every Season. Written by Jackie Garvin, the author of Syrup and Biscuits Blog and Biscuits: Sweet and Savory Southern Recipes for the All-American Kitchen, it would make a wonderful gift for a southern cookbook collector. The book is full of beautiful color photography. There are so many delicious recipes in the book, I had a hard time deciding which one to try first. 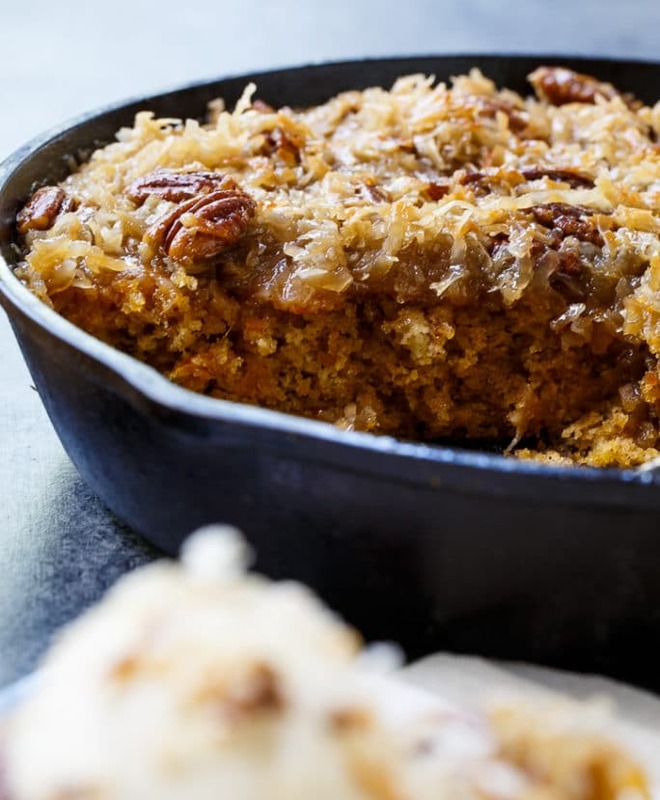 I flipped through the pages at least a dozen times before settling on this Sweet Potato Skillet Cake with Broiled Coconut and Pecan Icing. I’ve really been loving my cast iron pan lately and a skillet cake sounded like just the thing to make. The recipes in Sweet Potato Love are divided by season and this one is in the Spring section but I think it would make a terrific Thanksgiving dessert or even brunch recipe. It’s very similar to a coffee cake. The cake part is a beautiful orange color and is wonderfully tender. Flavored with just the right amount of cinnamon and ginger, it’s hard not to overindulge on this cake. The Broiled Coconut Icing is the perfect topping for it. I love the texture contrast a broiled coconut icing gives a tender cake. Delicious! I have a deep love for sweet potatoes, especially since I grew up in North Carolina, the Sweet Potato State. I adore them in both sweet and savory recipes. They are so versatile in the kitchen and are full of wonderful nutrients. I am sure I will be using recipes from this cookbook again and again. 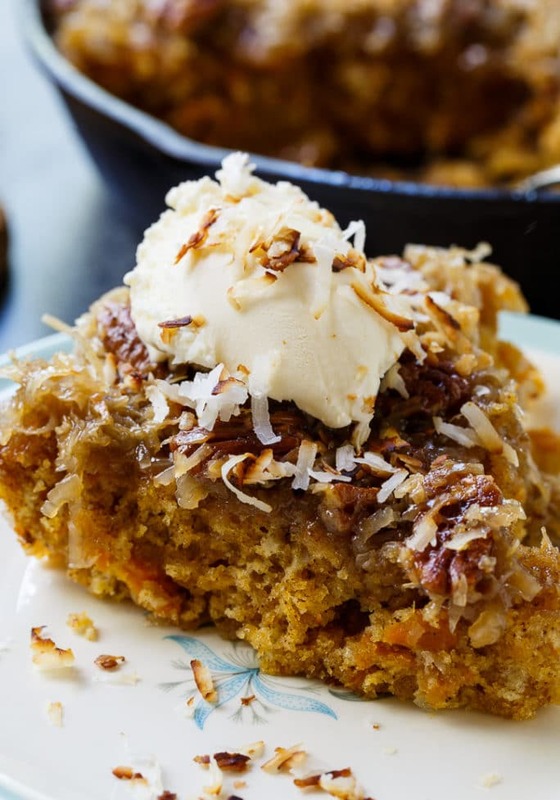 Love sweet potato desserts? 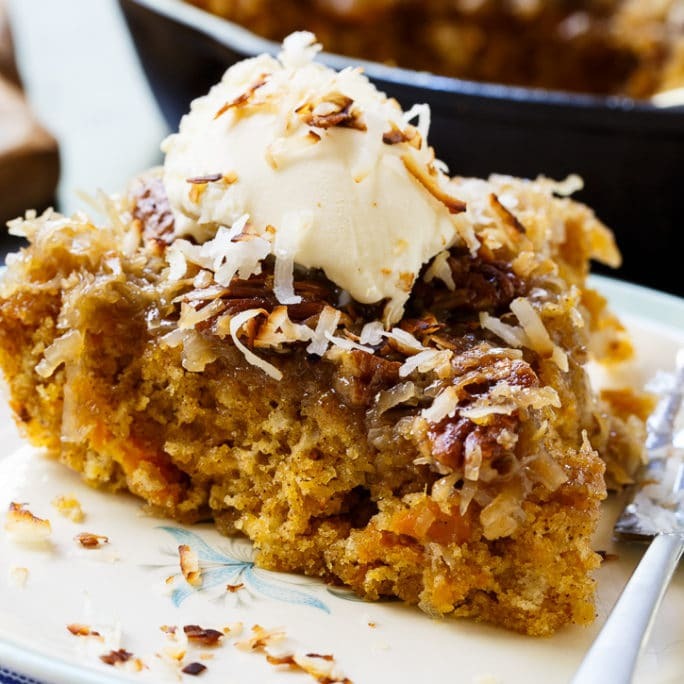 Here is another recipe for sweet potato cake that is delicious! This entry was posted in Cakes and tagged cake, sweet potato. Bookmark the permalink. This was a find, and now a staple in my cake arsenal family and friends love it. Thank you, Christin, for this lovely review. I appreciate your generous spirit. Your welcome Jackie! Love your cookbook! Oh my word! 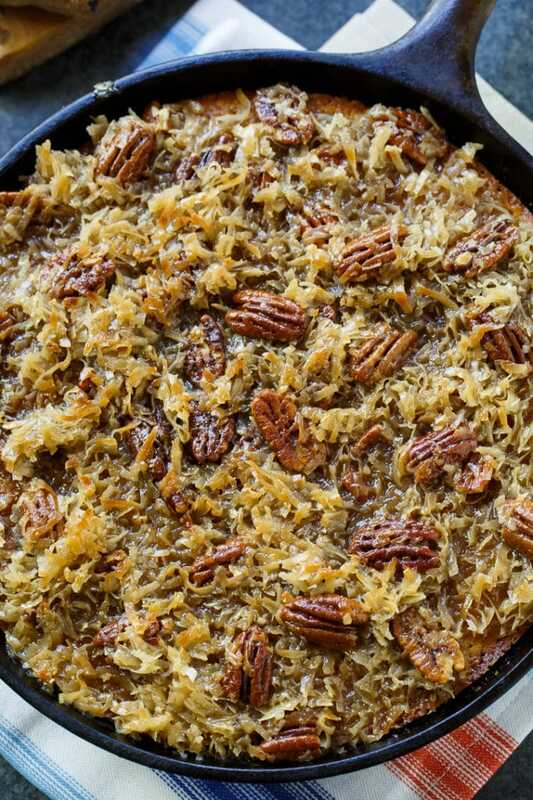 Christin, this Sweet Potato Cake with Broiled Coconut and Pecan Icing is not only flavorful, but it is GORGEOUS! I am so loving that pecan icing with broiled coconut – the texture! the combo of flavors! Wow! Oh my goodness that broiled icing sounds great! What a fun idea. I think a slice of this cake would send me to a happy place right away. And I’ve never had a sweet potato cake before! My love for sweet potato runs oh so deep!! And this cake sounds marvelous! I’ll take a big ol’ piece! Wow! I love the idea of a cake made in a skillet! And broiled icing?! This looks fantastic, Christin! Broiled coconut frosting is pretty much my FAVORITE thing ever. It is so, so, so good. I feel like people underestimate HOW good it is! This is a winner for sure!